Why Does My Rottweiler Eat Poop? Sometimes our Rottweilers do things that make us shake our heads. Eating poop is one thing that we as humans cannot seem to wrap our heads around. So why is it that our dogs want to eat poop? The answer to that question may be more complex than you anticipate. Your Rottweiler knows when they are lacking nutrients. Even though we try our best to feed our dogs the best diets we can, there can be medical reasons why your dog is eating poop. And it is not limited to just their own, it could be other dog’s, or other animal’s poop they are eating as well. This bad behavior is called Coprophagia. Pancreatic insufficiency, or enzyme deficiency is a common reason why dogs eat poop. The pancreas secretes digestive enzymes that help the dog digest food. So when your Rottweiler is experiencing digestive issues, they tend to eat their poop to hopefully ingest those enzymes that they may be lacking for digestive aid. This is really gross, but your dog doesn’t know how else to get these necessary enzymes back into their bodies. Intestinal malabsorption may also be a reason why your dog is eating poop. This can be caused by the presence of intestinal parasites. When your Rottweiler has parasites, they become unable to absorb proper nutrients. So your dog may be searching for ways to supplement the loss of nutrients by consuming enzyme rich poop. This is why it is extremely important to have your Rottweiler’s stool checked by your Vet every 6 months. A parasite free dog is a going to have less reasons for this “crappy” behavior. 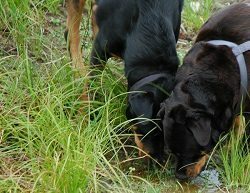 Your Rottweiler will not just try to eat their own poop, but may also want to sample other species poop as well. This can be incredibly frustrating if you own another pet and keep catching your Rottweiler snacking on their turds. There are several reasons why your dog may be seeking out their poop, so let’s discuss what these reasons may be. Dog’s love rabbit poop. It is a known fact. Why is that? It’s because a rabbit’s poop is one of the richest sources of Vitamin B as well as digestive enzymes, making it an irresistibly enticing snack. Cat poop is another favorite in the dog community. Many cheaper cat foods contain ingredients that are not bioavailable, so food that has not been processed will be eliminated from the cat’s body without being fully digested. This is very desirable in your dog’s eyes and they can be found snacking out of the litter box to soak up some of these nutrients your dog may be lacking in their current diet. 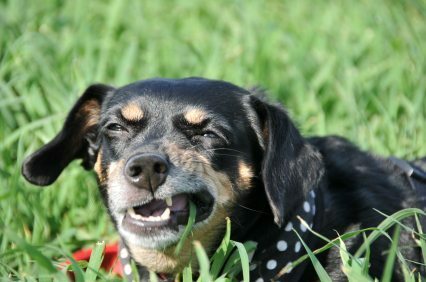 When a dog feels stressed out an anxious, they may eat poop. This is a common issue in dogs who have been in a shelter. They may be eating poop to help relieve these feelings. This can also be an issue with dogs who come from puppy mills. These dogs are generally caged with lots of other dogs and may not have regular access to food. Since they have to struggle or fight for food, they can pick up the bad habit of eating poop because they become accustomed to not knowing when their next meal is going to come. 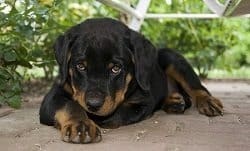 Rottweilers can also be known to pick up the gross habit of eating poop due to being punished for eliminating waste where they are not supposed to. When they are punished for pooping, they may develop the idea that pooping is bad. So when they poop, they eat it because they are trying to hide it. They don’t want to get punished. This is why hitting your dog or scolding it when they have an accident is such a bad idea. You need to only praise them when they poop where they are supposed to, so they know that pooping is ok. It’s fine to go outside, but no reward will be given for pooping in the house. Always make sure you pick up your Rottweiler’s poop as soon as they go. This eliminates the problem if they are exclusively eating their own poop. If there is no poop to eat, they cannot eat it. If you have cats, make sure your Rottweiler does not have access to their litter box. Move the litter box to a place where your dog cannot get to it. You can also try using the self cleaning litter pans that will clean the box right after the cat has been in it. Try to improve your dogs diet by adding probiotics or enzymes to their food so they will have the nutrients they need for healthy digestion. This way if your dog is lacking something in their diet that they are trying to supplement with poop, they will not have that necessity to do so anymore. Try keeping your Rottweiler busy. Give them lots of toys that can challenge them and keep them busy. Sometimes they just eat poop out of pure boredom. Keeping their minds occupied and challenged can be enough to curb this bad habit. Remember that they can be eating poop because of medical issues. Feeding them a healthy diet and having them regularly checked for parasites can help eliminate the need to supplement poop into their diet. Dogs can develop this habit if they are in an environment where food is scarce. Keep your cat’s litter box where your Rottweiler cannot access it. Pick up their waste immediately so they are not compulsed to eat it. 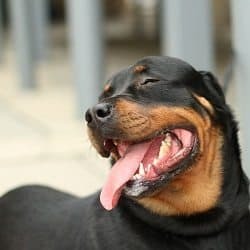 Your Rottweiler may be eating poop out of shame, so never punish them for pooping or they may begin eating it so you won’t know they had an accident.